The Martin Dabs1 interface is a handy tool for uploading of fixture software from a PC base. Using the USB connection from any Windows based PC or Laptop computer, the Martin Dabs1 interface can upload fixture software directly to one, or multiple fixtures, over the serial link. The Martin Dabs1 requires the computer the Martin Uploader program which is available for download free of charge from the support section of the martin.com website. Once connected, new software files can be downloaded from the internet directly to your PC and, via the Martin dabs1 interface, be uploaded directly to your fixtures. 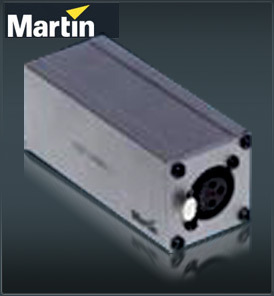 The Martin Dabs1 interface is fitted with a 3 pin XLR connector for connection to the fixture serial link, and a USB connector for attachment to your computer.